Here comes the second pair of vintage Etonic shoes I own and have even began to cherish. Simple design, nice colorway (indeed, neon yellow) and at that moment a very high profile running shoe. In 1876, the man who inspired the Etonic name, Charles A. Eaton, opened his first shoe factory in Brockton, MA. Over 60 years later, the Charles A. Eaton company ventured into golf shoe manufacturing, where it quickly gained a reputation for leading-edge technology and design. By the 1950s, hundreds of golf professionals were wearing the company’s “Tournament of Champions” line. Two decades later, the Eaton Company recognized an opportunity in the running shoe category, and it soon became one of the most trusted and respected brands among diehard runners. 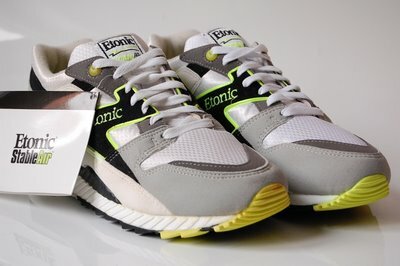 In 1976, the company officially changed its name to Etonic. 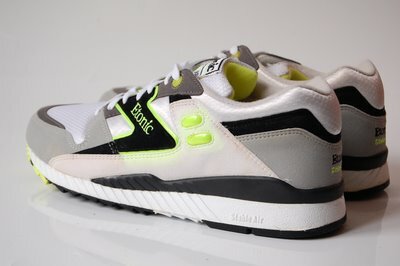 In the years that followed, Etonic was sold and acquired by several different corporations. 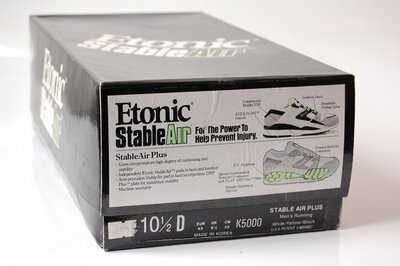 But despite changes in ownership, the company never lost sight of its core values, and quietly continued to build upon its rich heritage of product innovations and industry “firsts.” From introducing the first golf shoe with GORE-TEX® linings to its breakthrough Stabilizer™ technology, Etonic continued to pioneer new ways to help athletes feel and perform better. To enhance the experience of their chosen sport. And to help them finish one step ahead. In fact, it was this relentless desire to explore—to innovate—that compelled a team of experienced shoe veterans to buy the company in 2003. Their goal? 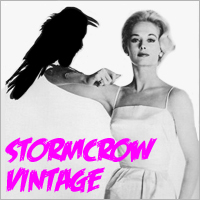 To link the company’s authentic past with its promising future by building great performance product. 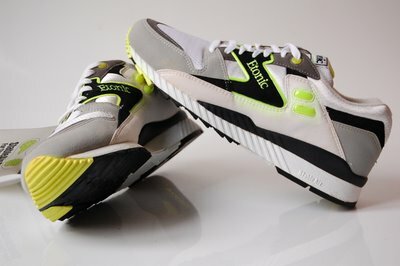 To reconnect with the loyal customers who have trusted Etonic through the years. And to captivate a whole new generation of authentic athletes and fitness enthusiasts. With this renewed focus, drive, and confidence, Etonic is once again positioned to evolve and return to where our customers always expect us to be.